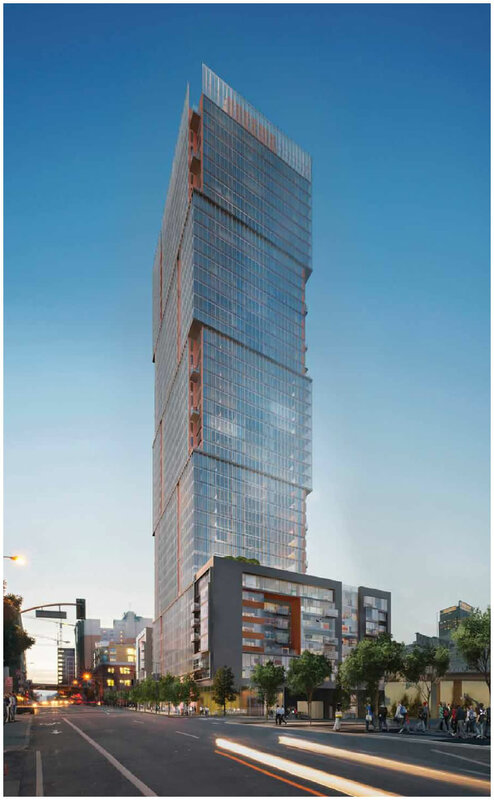 The designs for the 400-foot tower and 85-foot podium to rise on Transbay Block 9, at the corner of Folsom and First, have been refined by SOM (tower) and Fougeron Architecture (podium), and the total number of residences and ratio of Below Market Rate (BMR) units within the development have been revised downward. 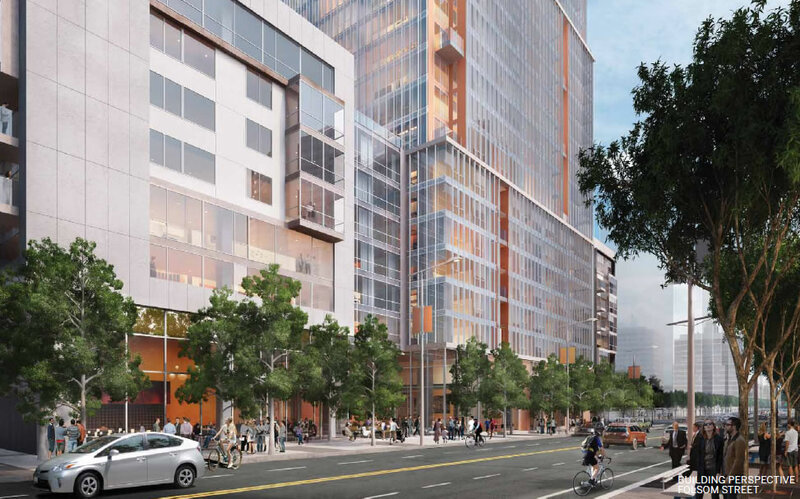 The 42-story development will now include a total of 545 units of housing, of which 436 (80 percent) will be Market Rate and 109 (20 percent) will be BMR, distributed across the lower 21 floors of the building, and available to households earning up to 50% of the Area Median Income. The winning proposal for the development had included 563 units of housing, of which 25 percent were to be below market rate. 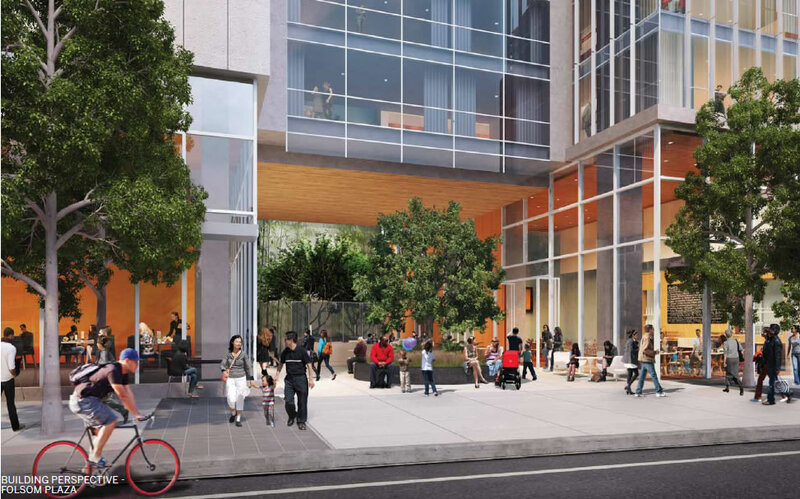 Nearly 7,000 square feet of retail and a 3,000 square-foot open space will occupy the ground floor of the development, with an underground garage for 206 bikes and 286 cars (including 3 spaces for car share and 3 charging stations). 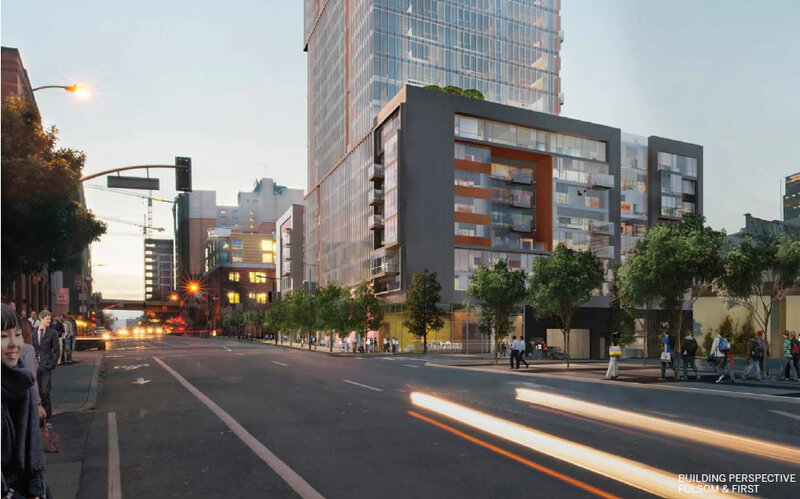 The developers, Avant Housing and Essex Property Trust, are scheduled to take possession of the Block 9 parcel in early February, a parcel for which they’re paying $43,630,000. Construction is currently slated to commence in July of 2016. And the development is anticipated to be ready for occupancy by the middle of 2019. I’m not an architect or anything so this is an honest, non-judgement-passing question: Why does orange seem to be a popular accent color for new buildings these days? In terms of color theory, blue and orange are complementary colors, so it’s a natural choice for contrast with the light blue glass. It is the color of the bricks actually. Maybe the orange is a nod to the Golden Gate Bridge. It’s pandering, but not all pandering is bad. As an architect I’ve never been a big fan of breaking up the exterior façade of a high rise just for the sake of variety. This is a prime example of that typology where only a few residences get balconies and most don’t. Sure, it may make the curtain wall more “interesting” but forgoes functional outdoor space. There are many ways to have multiple balconies and still have great variety. This seems to be just an exercise in exterior decoration and not much more. The two firms designing this are very skilled and I feel could do much more. I wasn’t aware the housing shortage in San Francisco was over. I wonder why I didn’t hear about it in the news. So we’re looking at a net gain of 14 additional market rate units from the initial proposal to the current one along with a simultaneous loss of 32 BMR units. I applaud the developers for keeping the affordable housing requirement on-site but it’s too bad that the ‘promise’ of 25% affordability went out the door as soon as the City selected their winning proposal partially based on those merits. Renzo Piano accents a lot of his projects with an orange/red color – Academy of Sciences, LA County Museum of Art, and if I’m not mistaken the NY Times building off Times Square. Not a fan of the renderings shown. Looks like the Ma8trix casino along Highway 101 near the SJC airport. Love it, though it seems crazy short for the location. So 42 stories is crazy short to you? Really? Ridiculous. I’m really glad you/re not in the Planning Dept. Perhaps you would like the Dubai skyline better? Everybody loves the Dubai skyline, people come from all over the world to see it. Have you even seen Dubai? The Dubai skyline is hideous: every know design trick and cliché is taken to obscene heights. Except for the Burj Khalifa. I disagree about the hideousness of the Dubai skyline. It takes engineering gusto to build such tall structures in the constantly shifting sand. All of the UAE is basically a desert. The Burj Al Arab is one iconic and beautiful building and it always will be. The (all duplex suites) hotel interior, on the other hand, is cliche and could have been much better. 42 stories at this location seems crazy short. Obviously it’s still tall, but this is the precise spot where we should be building the tallest buildings on the west coast, not something that would fit in with the tabletop of Vancouver. Personally I liked the old design better. I admire the roof top park it once had. this has come up here before, but i am really curious how they charge HOAs for the BMR units? Are HOAs just waived or severely subsidized? <50% of median income is really living in poverty in SF. my understanding is that the BMRs don’t have access to the amenities the MRs do, eg gym, pool, doorman. Often have a separate lobby, derided as the “poor door” but can be sensible considering the need to keep their operating costs lower. So Mr. Futurist. Since you are the expert architect what buildings designed by you might I have seen in the city? Good luck with that, I’ve tried getting it out of him numerous times. He always pleads the fifth. Yet he freely bashes everyone else’s great designs. Jealous much? Ha Ha.No I actually freely critique both positive and negative other projects. But to answer your question: Most of my work here has been high end residential interior architecture. My contribution with large firms has been with work mostly in Southern California and Hawaii. But, honestly, it does seem pretty irrelevant as to inquire my own work with regards to the comments I have made here about this particular building. Got it, so you’ve remodeled some kitchens. Makes much more sense now. Ad hominem attacks aren’t fair. People should debate your opinions based solely on the strength of your argument. That said, no one likes anyone who is always a cynic (not you specifically, just in general). Also, your expectations certainly change after you work on a high-rise building yourself. There are so many factors and different parties involved. They never quite turn out like how any one person wants them to, but they turn out OK.
Ha ha. No, I am a licensed architect and I have designed projects, solely and as part of a large team, works ranging from complete single family homes, multi-family projects, civic architecture, health care and hospitals, airport projects and yes even high rise buildings. The all involve interior architecture as well, which is a very different set of skills from an “interior designer”. Both are valid and essential to the work. @anon: I don’t mind your silly little digs at all ,since you seem enjoy that kind of dialogue here on line. @Ham: you’re certainly free to agree or disagree with my design opinions here. But I really don’t have to validate my professional experience to you or anyone for me to have opinions. However, I decided to indulge you somewhat with a bit of my background. I hope that meets your investigative analysis. If you don’t like my particular commentary then feel free to debate it and offer your ideas on the design. But yes, there are plenty of “armchair” critics here offering little more than calling a project “fugly” or less. They offer nothing important to the dialogue. Futurist- just like you don’t have to validate your opinions, neither does anybody else. Everybody’s opinion is valid. Architecture is a social, public construct. It is for people. Not for licensed interior designers, architects, or whatever other label you want to call yourself. Everybody is entitled to their opinion, and yours is not any more superior than anybody else’s. Great architecture speaks to everybody, and should be enjoyed by everybody, not just you. That is the point we are trying to make. No, it’s not about validating opinions. Of course no one HAS to have a degree in architecture or engineering or design to form an opinion. And yes, everyone is “entitled” to an opinion. But simply calling a building “fugly” is the most simplistic and meaningless opinion out there. If it’s truly fugly to you, then why not elaborate a bit on WHY one thinks so. That’s really the point I am making. Elaborate. Articulate. Show some intelligence. Show some thought. And no, my opinion is not superior to anyone else’s. I just take a little time to put together a few words to explain WHY I have this particular opinion. But sfw, you are wandering a bit in your statement. Why would you possibly think that “great architecture” should be enjoyed by everybody, not just me. Why do you possibly think that? Here’s why I think you think that way: Others here, not all , but many are simply intimidated and/or irritated by my particular STYLE of opinion. They may see it as high-brow. or superior. Well, guess what? it’s not. it’s simply based on my professional training and how I learned to talk about design criticism. There are others who write here with some degree of thought and intelligence too. But if others choose to call something “fugly” then that’s their choice to just throw mindless words on the screen. I agree that critics and enthusiasts should extrapolate on why they love or hate a design. But SF is a city of very conservative people when it comes to anything new, so they are not going to like anything other than something that looks less than 100 years old. In defense of Futurist, the lack of balconies for most units does seem like a design shortfall. Agreed the lack of balconies on residential tower units is kinda lame. And am I the only one who thinks they sacrificed them for a “look” that is very reminiscent of sheets of corrugated metal roofing glued haphazardly to the side of the building? Looking at those three car share spots in the garage made me think: Why don’t these big residential towers just work a dozen leased cars into the HOA agreement, reservable by residents for a nominal per hour fee (the fee ensuring they get returned in reasonable time). They could lease a dozen cheap cars for 2500 a month. Split between 500 units that’s just 5 bucks a month and would relieve a good bit of the parking pressure. why would a building want to run its own car-sharing operation? that’s insane. zipcar and its competitors provide this service admirably. probably liability as well as outside their expertise would keep most of them from outright leasing vehicles. I think we will see more deals with car share companies to get into some of these buildings. For the same reason that buildings in the past would often not buy and operate their own coin washers and dryers, but hire a third party to do the whole thing. It’s a pain. O . . . M . . . G . . . that is one fugly building. That is truly a hideous structure. And by ‘retail’ they really mean a big empty space. It may look much better after they remove all that construction safety netting. this deserves a ‘like’ button. my first reaction was that the whole thing looks like it’s still under construction – like when they remove curtain wall panels to be able to access the interior. Looks like a low class prison. That’s EXACTLY my first thought! It reminds me of that billionaire’s house in Mumbai and I don’t like that one either. Aesthetically, it isn’t pretty nor graceful a building. Golly gee why so much open space? 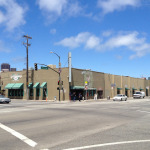 500,000 SF of building and 3,000 SF of open space. HOA fees are not subsidized in BMR units. This creates problems with finding someone who makes little enough to qualify for the program but can still somehow afford HOA dues. A lot of people like bashing the poor door/limited amenities or off site BMRs, but they can avoid this situation by having lower dues. Aside from the high HOAs in BMRs, even with a poor door, this raises again the issue of the problems with inclusionary BMR housing. While a laudable goal to have neighborhoods with mixed income levels, requiring luxury developers to built BMR housing on-site or in the same neighborhood defeats the cause of building more affordable housing. This land is very expensive and housing built there needs to be expensive to attract developers. Requiring affordable housing in an expensive neighborhood means that far fewer units will be built than if the City allowed the affordable housing to be built in neighborhoods with more affordable land. There will always be rich neighborhoods and poor neighborhoods. The City should be more focused on building housing for the middle and low class in cheaper neighborhoods and then ensuring that services are provided equally to all neighborhoods regardless of where they are. The BMR can be lower-floor units, with lower grade fixtures and furnishings. The developer can still more than recoupe its investment. Than might help a little, but it is still much more expensive than building elsewhere. High- and mid-rise steel/concrete structures are much more expensive to build and maintain. Even operations and maintenance of public areas (not the separate common areas) needs to be kept to the same standards of the luxury units and all the owners/tenants have to pay for that. Couldn’t agree more. Stupid regulations by Stupidvisors. i still dont understand how this works. 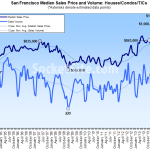 Assume the market rate units will be at least $1,000/mo HOAs. For the poor who make <50% of median, I cant imagine they could buy the unit and afford more than a $150/mo HOA. These luxury buildings should jsut pay the BMR fee and not put BMR in the buildings. We can build many more BMR units in cheaper parts of the city for the same cost. why are we not buildng 3 BMR units in the bayview instead of the 1 here.? Maybe they can refine BMR. For a building with average selling price of $3 million, selling at $1million will be below market rate. If the average income for the building is 500k, they can require the BMR buyers to each less than 250k. This way, everyone has an opportunity to live beyond one’s means. A 250k earner can live close to the 500k earners. I agree, I’m an owner of a BMR in The Metropolitan which is right next door. I love living in the neighborhood but my monthly HOA dues are $709.32 for a one bedroom; the same as a market rate owner. I would be happy to ditch all the luxury amenities and enter by a poor door if it meant lower HOA dues. It is indeed a stretch for many BMR owners to pay a mortgage, HOA dues, property tax, mandatory condo insurance etc. It does look like a county jail sitting on top of a college dorm. Thankfully this one will be hidden by other buildings all around it. Since Essex is a multifamily REIT, I suspect that these are rental units not for sale (condos), so all this HOA discussion is moot. I particularly love this building, and it is one of my favorites. Orange is my favorite color, so I may be biased. The sharp edge shapes with slight counter balancing retains symmetry and also adds visual interest. The varied balconies continue this look. This is a bold skyscraper that will look great on the SF geometric skyline, and we need more of this! I agree entirely with you: a singularly striking structure. 2013 blurb linked above. Especially those of”Mark” commending the staggered use of the balconies. I like it because it reminds me of Edward Burtynsky’s Shipbreaking series. In a good way. So why does this project require two architectural firms? Are not the podium and the tower one in the same structure? The city probably had a small local business component requirement as part of the RFP and this is how the development complied. FWIW, I’m an architect and I like the design. I like how the tall slender nature of the high rise massing is broken up by the subtractive balcony elements. Side note, I’ve read on previous posts on this site how balconies in high rises are mostly a money grab by developers. The logic goes that buyers want them, but in reality, they’re always wind swept and cold. They’re to small to really use and bbqs are prohibited. So in the end they’re only used for smoking. So the steel curtains eliminate the need for real curtains or window coverings in the unit then? Do they block out the sun and deflect heat during the summer and retain warmth during winter? Or are they just for aesthetics? Remember when there was an uproar over Prada’s flagship store in Union Square. The facade was also steel with holes. Appropriates Ed Lee housing policies of BMR? Calculating buildings and numbers rentals. this answer if. Chose reside in high price. San Franhattan for only the wealth. No longer city enjoy rental. Business only club Ed your a joke! Answer housing crisis for lower income. 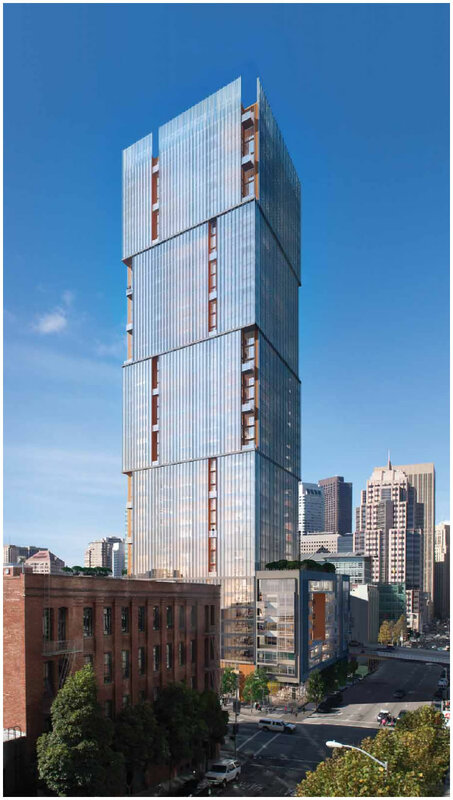 UPDATE: Team Preparing To Break Ground For 400-Foot Tower on Transbay Block 9.